The number of monarch butterflies is at the lowest point in more than two decades. Every winter, they go to a valley in Mexico. 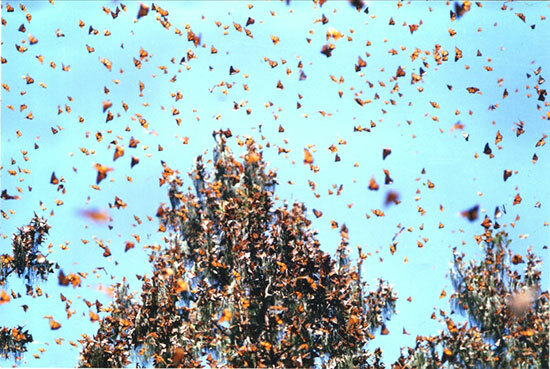 Because the butterflies clump together by the thousands in trees, they are counted by the area they cover. They used to cover more than 44 acres — as far as the eye can see. Now they cover about an acre and a half. That’s because the forests were being cut down in Mexico. They made it illegal, because people were hauling out lumber covered with monarchs. Can you imagine that? They had giant lumber trucks full of big pine trees that had been cut, and they’re covered with monarch butterflies, and they’re hauling them out for timber. Think about it: We’re at the point where we’re so desperate that we would destroy the butterflies for a bunch of beams. Makower: So, logging is what’s destroying monarchs? McDonough: Today, the collapse of the monarch is connected to the loss of milkweed, resulting from herbicide-resistant corn and soybean crops and herbicides used in the United States. That’s killing the monarchs’ main food source, milkweed. 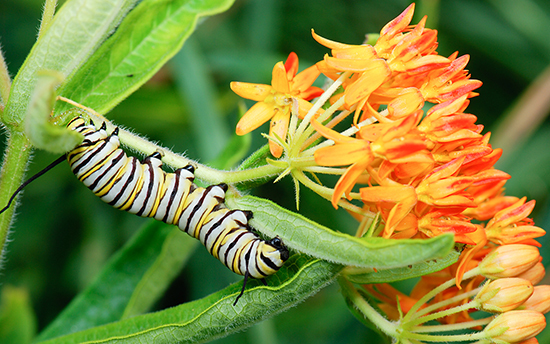 Without milkweed, we have no monarchs. As a designer, I like to say my first job is to change the way you see, then we rearrange furniture, and maybe we’ll build. But the first job is to change the way you see. So, I’d like to pull back now to encourage everyone to learn, to see if there’s anything we can do. Makower: So, what does it mean to pull back? How do we unwind this? McDonough: I don’t know how we’re going to unwind it in a hurry. I just know nature needs us now, so here are my thoughts, and they’re humble and they’re preliminary, but there’s an urgency to this so I feel like I can express them. And if they’re of any use or they inspire smarter ideas, that would be great. One, we honor our children. The Annenberg Foundation helped fund an app for monarchs. So, children can use their smart phones and take pictures of the monarchs that are migrating where they live, and it gets recorded and we can track the flights of the monarchs. Isn’t that beautiful? Joel, are you ready for a data point: 900,000 kids downloaded this app. Think about it. Makower: Wow, that’s a lot of butterfly-loving kids. What do you think the theory of change is around this app and the 900,000 kids who downloaded it? What will happen as a result? McDonough: It gets us the fact that children care about this — that our children are delighted by the butterfly. Wouldn’t it be nice if they could care about them when they’re still there? Makower: That’s a start, but it doesn’t really address the urgency. McDonough: So, here’s my idea: What if we declared an emergency with the monarchs, and we said, “Let’s get our communities out planting milkweeds” — along highways, along rights-of-way? It’s public land and it’s everywhere. What if we honor the butterflies by saying, “We’re not doing weed control on our railroads past the fire-resistance line. We want weeds for our butterflies.” And all of a sudden we develop a national butterfly habitat restoration program on public rights-of-way, and we let the communities volunteer to come out and plant. We would end up with milkweed everywhere along the highways, where we need it. I’m ready to go into the design community and say, “Let’s roll.” I think we ought to find the traffic engineers, we ought to find highway departments, we ought to find people in all communities across America and rise to this occasion. This is our season — it’s spring. We can’t wait until the fall and say, “Oh, what a good idea.” It’ll be too late. Makower: So, help me frame this for someone in business. Why should it matter to them that we have monarch butterflies? On the other hand, you might have values that tell you the butterflies have a value. It may not even be an economic value. Once we start to think that way, we might find the metric, but only if we start with our values. Makower: How about a company that wants to think about this through its value and principles? What would that sound like? McDonough: It would be like, “This is something that our community cares about. We could use it as a chance to get together and have picnics, and make it a common point of reference and see if it has any resonance.” So, all of a sudden, your local pizza company says, “We’re going to do a monarch emergency action. Let’s get out with our friends and neighbors and use it as a chance to get together.” The more chances people have to communicate in business the better. This is a chance for us to talk together around these issues. Makower: So, let’s fast-forward a year and declare victory because for whatever reason — maybe people reading this article — there were massive movements to plant milkweeds and the monarchs started to come back. What do you think the lesson is that would inure to even greater successes, and even bigger sacrifices than merely having weeds in your local park? McDonough: It’s about changing the way we see. Right now, we see things as being tidy, and less is more. In biodiversity, we don’t want less; we want more. So, if our whole way of seeing the world is through a goal of zero weeds — well, we’re doing great. But then you have to ask yourself, is your goal no butterflies, too? Because guess what: They go together. Makower: Isn’t there also a tragedy of the commons going on here? The tragedy is that we want the park to be neat and tidy and nature isn’t like that. McDonough: Yes, exactly. That’s what I mean about changing the way we see. “What is beautiful?” is a fundamental question. But what I’m asking is a different question. I’m asking, “Doesn’t the monarch butterfly have the right to exist? Doesn’t the monarch butterfly deserve our celebration? Don’t we get to celebrate what is beautiful because we’re humans and we love butterflies? Isn’t that enough?” If you want to live in the cleanest, least-offensive, most weed-free place, it’s really simple to do. But is that what we want? Makower: So, I guess part of the message here is that nature is messy, and that’s beautiful. McDonough: Right, and it doesn’t need a reason to exist other than it makes us love the world. Makower: So, Bill, what do you think the bigger lesson is here for business, in terms of thinking about priorities, beauty, the commons, about what’s really important? Makower: So, the question becomes, why would you design a system that destroys butterflies? McDonough: Exactly. That’s what we did, but we didn’t do it on purpose. I’m not going to say that anybody set out to destroy the butterfly, it’s just what happened. There’s no time here for guilt. There’s no time here for screaming or wagging fingers. Just get on it. And if you’re not part of the solution, just get out of the way and let us plant the weeds. Makower: I’m still having trouble with the messaging of that. McDonough: Then don’t call them weeds, call them butterfly habitats. Change the name. Call it milkflower instead of milkweed. Makower: Exactly. Who doesn’t like milk or flowers? Only the lactose-intolerant won’t like it. McDonough: I think your point is really well taken. I think the milkweed absolutely needs to be renamed as the “monarch flower.” Or let’s get the kids going on this to crowdsource a cool name, renaming the milkweed. That would be a really fun exercise. Makower: So, nature needs humans, but it also needs a branding expert. McDonough: Absolutely! The monarchs are in urgent need of a branding wizard to take on milkweed and call it something fresh to get everybody cranked up.